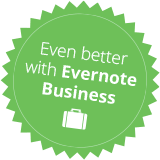 Amplify the collaborative power of Evernote with the Evernote-Redbooth integration. You’ve captured a wealth of ideas in Evernote. Now connect them to your tasks. Free up bandwidth to focus on top-priority projects — many Redbooth users save an hour a day (or more) now that they don’t have to rely on email for everything. And when you’ve finished a project and ready for the next challenge? Let everyone know by marking it “resolved”! No connection? No problem. Keep content available even without Wi-Fi. Skip the meeting. With the information available to everyone, giving updates in real time is easy. Smart categorization lets you build an organization system that works with your team’s flow. With Evernote Web Clipper, every bit of research is collected and findable in Evernote, forever. Evernote syncs to all your devices so you have your notes at hand, everywhere.